At Azule Kitchens we understand that your kitchen is the heart of your home and that no two kitchens are the same. We work hard to bring our customers a product that is tailored to their unique individual needs at an affordable price. We believe your experience should be easy and enjoyable so we have hand crafted our own unique approach to ensure our customers are completely comfortable working with us and are informed throughout their entire experience. Our exceptional products and dedication to our customers meets the highest standards for quality in the industry. We provide complete solutions for all your cabinetry needs, from innovative trends to classic traditional cuisine. For many years our knowledgeable team has been helping home owners take their visions and turn them into stunning masterpieces. Our team understands that home renovation projects are a big investment. We make it our duty to ensure your project runs as smooth and efficient as possible with full attention to detail. Our team is easily adaptable and well equipped to meet and exceed all your expectations. We provide exceptional service and we have only the most qualified and experienced designers, trades and installation teams to execute your new project seamlessly. 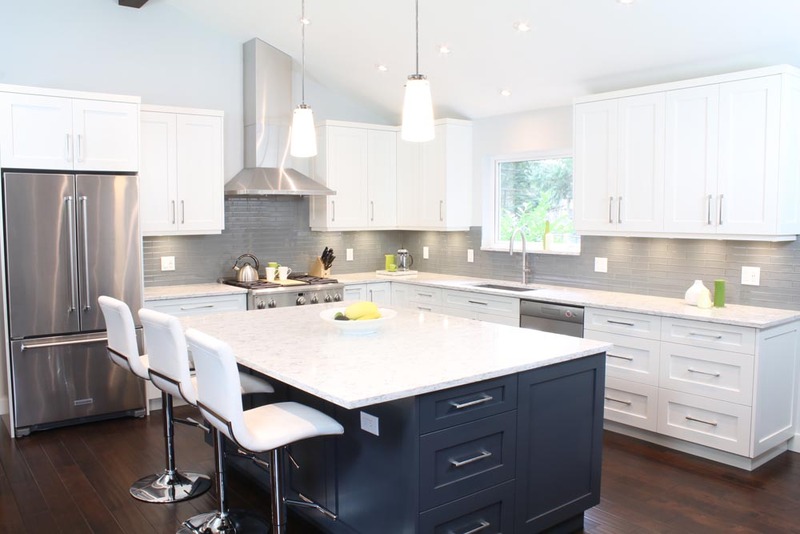 Our primary focus is providing a top-quality product at an affordable price along with the highest level of customer care to make sure your new kitchen or cabinetry project is fully functional, efficient and beautiful! We offer a full line of quality cabinetry for your home or office. Whether your looking for a new custom kitchen, island, vanity, built in unit, furniture piece, entertainment center, laundry unit, book shelf, fireplace unit, closet organizer, pantry, bar or have a fine custom woodworking project in mind, we can do it! If you can dream it, we can build it! Outstanding service, quality and workmanship! We are beyond happy with our new kitchen and cabinetry. Dealing with Bethany, Ryan and the Azule team was so easy and such a great experience! Their knowledge and passion for what they do truly shows! We look forward to working with them again in the future and would highly recommend them. The search for a contractor to complete our kitchen and washroom renovations was daunting and overwhelming. We then were introduced to Bethany from a contractor we had originally chosen to work with. Bethany was warm, friendly and had an innate ability to understand our likes and dislikes. She developed a 3D image of what our kitchen would look like once the renovation was completed. It was everything we could have hoped it would be. Bethany, Ryan and the Azule team were not only pleasant and professional to work with throughout this process, they were also patient and understanding of our needs and timelines. The end result was an unbelievable transformation that surpassed anything we could have ever imagined! We absolutely Love cooking and entertaining in our new space. For us, the most important part of this process was the relationship we developed with Bethany and Ryan. They are not only the quintessential professional, they are genuinely kind people who go above and beyond to ensure that you are happy with everything right from the conceptual beginning to the completion of the project. Thank you for the Amazing work on our kitchen and washroom !! We would highly recommend Bethany, Ryan and the Azule team to anyone, anywhere! Thanks Bethany and Ryan for the Great Kitchen Reno... Great service and Great product. HUGE selection and alot of help with ideas.. Our Kitchen now looks great. WE will definitely pass your info onto all our friends. We started working with Bethany at Azule Kitchens in November of 2017, to design cabinetry for our new built home which included; kitchen, bathroom vanities, bar area. It took us a few months to come across Azule Kitchens as we shopped around with other vendors. Our past experiences with other cabinetry dealers was very negative and generally unpleasant, the prices we were encountering were also very high considering the lack of quality of products and service. We knew we hit the jackpot as soon as we met with Bethany and walked into the showroom. From start to finish the service was IMPECCABLE! The price point is also very good for the quality of product and installation service Azule provides. We have now finished the installation process and we are beyond pleased with the workmanship and the overall visual aspect and design of all cabinetry. Truly a showpiece! Azule Kitchens is family run and they put their family values into how they treat their customers. As a customer we felt that and experienced the level of care everyone at Azule has. We couldn't be more pleased and happy with our decision to work with Azule Kitchens. I would definitely work with them again and would recommend them to family, friends or anyone looking to upgrade their kitchen. Not only was the price great and product top notch but the service from start to finish was also second to none. The overall experience was great! Bethany patiently worked with us to design a beautiful kitchen and space with lots of great suggestions along the way. She was very patient and very helpful throughout the entire process and was very understanding. Ryan's attention to detail and ability to run the job site smoothly and efficiently made sure the project ran smooth from start to finish. The entire Azule team treated our home and ourselves with the upmost respect, the whole team was very punctual, our house was always kept clean and tidy and they ensured everything was completed with top quality workmanship. You can definitely see the entire team works very closely together and they ensured the renovation was as stress free for us as possible. I would highly recommend Azule Kitchens to anyone. Thank you Azule team! Keep up the great work! Azule kitchens made our dream kitchen a reality! Bethany took our vision and designed the most beautiful kitchen for us. She was a pleasure to work with and did everything possible to make sure we were happy with the end result. She specially ordered hardware for us and was also able to get us discounted prices on our sink, faucet and countertops. The quality of the cabinets are superior and did not disappoint. Bethany and Ryan also made sure the installation process went well and were present throughout. Their attention to detail, quality assurance and customer service was remarkable. Thank you for everything! Want to start your dream kitchen project but don't know where to start? Contact Azule Kitchens today. We are here to help you with any questions you may have.